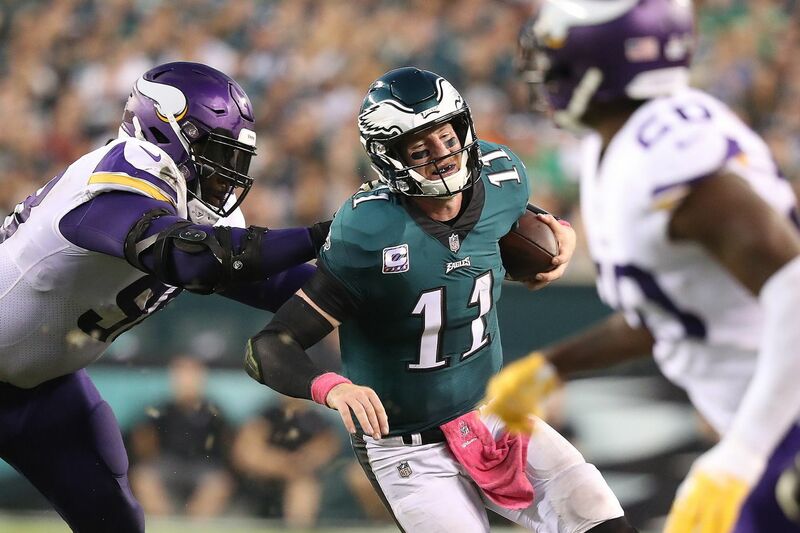 Carson Wentz is shoved out of bounds by Linval Joseph during the Eagles’ 23-21 loss to the Vikings on Sunday. Sooner or later – and now that they're 2-3 following their 23-21 loss on Sunday to the Vikings, sooner would be preferable – the Eagles will need Carson Wentz to win them a game. That's asking a lot of a quarterback who has played just three games since doctors declared that he had completed his rehabilitation from two knee-ligament injuries last December. Perhaps it's asking too much. But the Eagles went after Wentz in the 2016 draft, went all in on him, because they believed him capable of handling such pressure and expectation, and, well, here we are. They are a game under .500 ahead of their first NFC East game of the season, Thursday night against the Giants at the Meadowlands, and they are playing sloppily, squandering opportunities to win Sunday's game and last week's against the Titans. And though Wentz put up sparkling numbers against the Vikings – 24-for-35, 311 yards, two touchdowns, no interceptions – he had not been the same quarterback he was last season, not yet. He has not looked nearly so crisp. He sustained too much punishment again Sunday: three sacks, eight quarterback hits, a sack/fumble returned for a touchdown. There are times when the pocket is falling apart around him before he has time to find a receiver. And there are times when he is holding the ball too long, either because no one is open or because he isn't quite sure where the ball ought to go. No, he doesn't look like the quarterback he was last season. He looks like the quarterback he was the season before that, when he was a rookie. You can see the promise, but you're not always seeing the right results. Carson Wentz has the ball knocked out of his grasp by the Vikings’ Stephen Weatherly in the second quarter of the Eagles’ 23-21 loss Sunday. "Personally, I feel fine," he said. "Obviously, we kind of have some ebbs and flows as an offense – slow start, seemed like we got some momentum, hurt ourselves again. It seems like it's where we were two years ago, when we were that young team, making those mistakes, kind of having those ebbs and flows. Last year, you didn't see a lot of that. The veteran team we have with the guys, I'm confident that we'll fix it and turn it around. But it's frustrating right now." The fastest and surest fix would be for Wentz to finish shaking off any lingering rust. Understand: No one should be blaming Wentz for the Eagles' losses to the Titans and the Vikings. He is not their primary problem. Truth be told, it's difficult to decide who or what is. The offensive line – particularly tackles Jason Peters and Lane Johnson – has underperformed. The Eagles, both on offense and defense, have committed too many penalties, and too many of them have been ill-timed and unforced. And a series of injuries major and minor, Wentz's knee among them, has upset the synchronicity and continuity of the offense. "We didn't have any continuity at the end of last season, and we won the Super Bowl, so I don't want to say it's the end-all-be-all, but it definitely helps," center Jason Kelce said. "With the amount of changes we've had – quarterbacks, receivers, running backs – it all does make little differences that sometimes culminate in big ones." But just because Wentz is not responsible for all of those differences doesn't mean that he can't counteract the damage they're causing. It's easy to forget, in the wake of Nick Foles' near-flawless play in both the NFC Championship Game and Super Bowl LII, just how often the Eagles won games last year because Wentz, more than anyone, won them. The Cardinals and Redskins at home, the Rams on the road before the torn-up knee – those were merely the greatest days and nights of a season in which Wentz, through 13 games, was the NFL's best player. The Eagles need some of that magic now, and maybe it just has to take a different form. Maybe it has to be … less magical. It can be as simple as not taking an 8-yard sack on first-and-10 from the Vikings' 15-yard line, as he did in the third quarter, on a drive that ended in a field goal when the Eagles could have used a touchdown. Or not throwing the football with his left hand on second-and-10 from the Vikings' 30 early in the fourth quarter, earning an intentional-grounding penalty and costing the Eagles a down and 10 yards of field position when a touchdown would have given them the lead. They don't need him to be spectacular all the time, just a little smarter. "We've got to take a real hard look in the mirror," Wentz said. "Little mistakes like that – really, the same thing happened last week. These little mistakes that sometimes can be overlooked are just killing us. We're playing like we're a young, rookie team, and we're not. We've got to really be hard on ourselves and learn from these mistakes and turn it around fast." That turnaround must begin with him. Is that burden fair? It doesn't matter. It's one every franchise quarterback must bear. Carson Wentz can be better, and starting Thursday night in North Jersey, with his team 2-3 and reeling, he has to be.